Glen Innes Severn Councillor Steve Toms, left, Northern Tablelands MP Adam Marshall and dance instructor Donna Jarrett in the Glen Innes Girl Guides Hall this week. 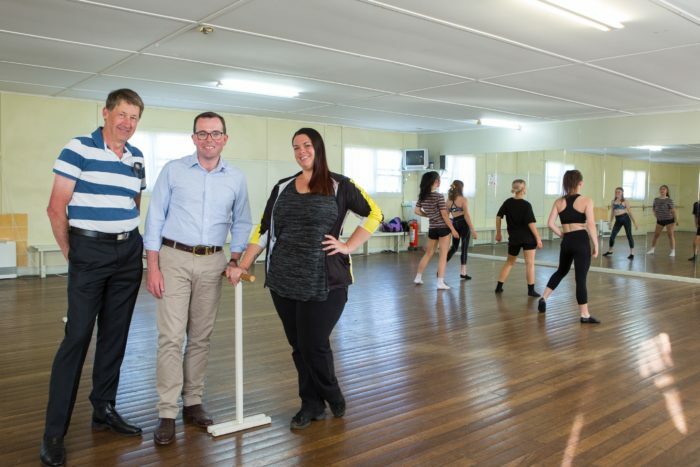 A MAKEOVER of the old Girl Guides Hall in Glen Innes will give around 70 young dance students a brand new space to strut their stuff safely, according to Northern Tablelands MP Adam Marshall. Mr Marshall today announced a $54,500 grant from the NSW Government’ Stronger Country Communities Fund to jazz up the old hall in East Avenue with a suite of restoration works. “This project will provide a better looking, better working and quality dance floor space for Glen Innes,” Mr Marshall said. Mr Marshall said professional dance instructor Donna Jarrett had run her Star Avenue Dance Centre from the old hall for the past three years with some 70 students stepping up their skills there four days a week. Mrs Jarrett said the funding boost will mean so much to many local dance students. “We won’t have to worry anymore about picking up splinters or have toenails ripped back from hitting nails sticking up out of the old floor – it will be great,” she said. The hall is home to ballet, tap, jazz, contemporary dance and musical theatre studio instruction but Mr Marshall and Mrs Jarrett say the restoration will also make it more appealing to other users. “Being able to spruce it up will give it more appeal for hire to other community groups as well,” Mr Marshall said. “This includes other exercise-based sports along with community activities. It’s near the Glen Innes CBD and right opposite a high profile parkland space that attracts plenty of out of town visitors, so the restoration will also involve some external works. “The external walls will be repainted to provide weather protection and renew the facade of a historically significant building, the roof will be replaced and the crumbling brick landing wall will be restored to improve safety.